How good is this? Our incredible city of Melbourne just cannot stop being voted the world’s most livable. According to the index, we are on top in terms of culture, environment and stability, which means we are some of the luckiest people on the planet. Of course, this is no surprise to the people that live here. The magic of Melbourne really comes from the variety on offer from the many different areas; such is the beauty of Bayside. Not only is The City of Bayside picturesque in its beachside surroundings, but it is also home to some of the city’s most beautiful properties. If you are considering buying a home in Bayside, it is natural to have some trepidation towards the value of your investment. By booking a pre-purchase building inspection, you can safeguard yourself by knowing what defects a home might be hiding before you sign on the bottom line. This could save you thousands in repairs down the track, allow you to negotiate a better price at the time of sale, or just point out the nitty-gritty problems that you might need to work on. More commonly known as salt residue, mineral efflorescence is when the salt in masonry is released after coming into contact with moisture. The salt deposits build up on the surface, leaving patches of white that detract from the original décor. This can leave an ugly look on the home, and be a frustrating cleanup job. The team at Premium Pre-Purchase Inspections utilise their building experience and knowledge of building materials to identify what the cause is and what you will need to do. Where’s there’s salt residue, there’s moisture, and where there’s moisture there could be an indication of greater problems such as leaks or pests. 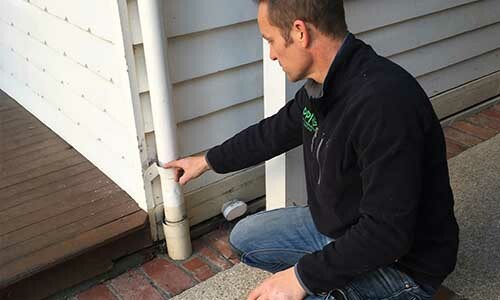 Moisture can find its way into a house in a number of ways, whether it is because of poor weatherproofing, leaky pipes, or even faulty air-conditioning units. When this happens, it can seep into the timber within the walls, roof void or even subfloors. And guess what? Moist timber is essentially a smorgasbord for termites. Once they find their way in, they will munch away for as long as their little hearts desire, leaving a damage bill and a giant headache for the owner. No one wants to buy a home, only to discover that these critters have been indirectly chewing away at your bank account. This is where Premium Pre-Purchase Inspections can help. You can combine your building inspection with a pest inspection to have your home checked for the presence of wood borers and termites, or any signs that they’ve been there before. Similarly, we will identify conditions that are conducive to them coming along, such as the build up of moisture in non-visible parts of the home, or firewood and bark situated too close to the house exterior. Our inspections are conducted in compliance with Australian standard. If you are looking to buy a home around Melbourne, you will likely be weighing up the pros and cons of certain areas. For Bayside, there’s not much other than the good stuff. The area is a collection of suburbs including Beaumaris, Black Rock, Brighton, Cheltenham, Hampton, Highett and Sandringham, meaning Bayside is home to over 100,000 people. They are drawn here for a variety of reasons, but who can go past the fact that it is right on the coast? As Australians, many of us have a deep fascination and love for the water. This could be due to the fact we live on the world’s largest island, with many of us having great memories of days filled with waves and white sand. On a warm summer’s day, there’s not much better than hanging with friends or family and cooling off with a dip in the ocean. A highlight of Bayside is Dendy Street Beach in Brighton—one of the most vibrant in the world. What makes this beach so fantastic and unique is the eighty-two colourful bathing boxes painted a variety of ways and lined up in uniformity. They are a time-slice of Victorian times, being present since 1862. Although owned and used privately, the beach boxes remain a major tourist attraction of the area and an iconic aspect of Bayside. In addition to the coast, Bayside brings incredible options to its residents. Whether it’s eating delicious food, drinking great wine, exercising in the many open parks, or taking the kids out for the day, there’s something for everyone. There are plenty of restaurants, farmers market and beach-side events that translate to an outgoing social life, regardless of if you are a young adult or looking to take the family out for the day. If you are inclined to keep fit, and are looking to get some kilometres in the legs, you might like to check out the bike and running track along the foreshore. At 13km in length from St Kilda to Half Moon Bay it can accommodate beginners or more intermediate fitness levels. If you feel like a leisurely stroll, it is also worthwhile heading down to the sand to watch the sunset over Port Phillip Bay. Part of Bayside’s drawcard is the lifestyle that its residents can enjoy while being situated in proximity to the Melbourne CBD. Not only can you immerse yourself in a unique community to escape the hustle and bustle, but you can easily make your way into Melbourne city to shop, work, catch a game at the G, or for a night out to let the hair down. A trip in the car will take only half an hour, but the train is just as easy, with the Sandringham line providing a direct route to and from Flinders Street Station. In addition to the geographical benefits, The City of Bayside may also appeal to you if you are looking to raise a family. The area is home to some of Melbourne’s most respected schools and is considered a safe and stable part of the city. If you are getting serious about buying a home in Bayside, request a quote from Premium Pre-Purchase Inspections today. A building inspection can provide you peace of mind for your investment.